Easy and user friendly hosting and management of your ads.txt and ads.cert file. Only a valid and up-to-date ads.txt file allows your advertisers to continue buying traffic from your website. The ads.txt Management System allows you to keep your ads.txt file valid, updated and available at all time! Create a website in our system in order to start managing your ads.txt. This takes not less than 3 minutes. Add the data of your partners. Choose from a list of predefined companies or add your own partners. 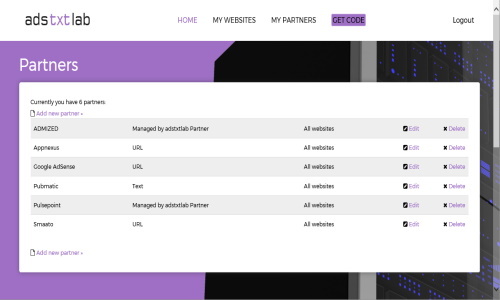 Implement our redirect code into your website and start using ads.txt and ads.cert.